Cannon Design - Virginia; ARC3 Architecture, Inc.
Space per pupil: 193 sq.ft. Eckerd College sought a new undergraduate research lab that reflected its unique educational pedagogy, the physical context of the campus, and the college culture which is embodied by the hallmark of “Think Outside.” This became the guiding design strategy for the $25 million, 50,000 square-foot James Center for Molecular and Life Science. In the days before air conditioning, the key to staying comfortable in Florida was to dress in light colors and carry a parasol. 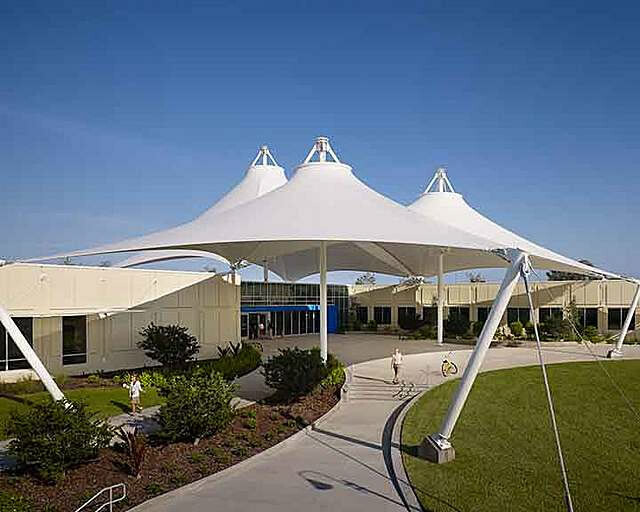 The design team employed this turn-of-the-century strategy with a highly-reflective white exterior and a white fabric “parasol” at the center of the complex that shades the building and creates usable outdoor space for collaboration, study and events. The precast bearing wall system is painted with a highly reflective coating typically used on pool decks that significantly reduces cooling load. The one-story building is massed as two wings connected by a central lobby that can be opened to the outside, with airlocks to separate the lobby from the wings. Science curriculum teaching labs are housed in the west wing, and advanced science labs occupy the east wing. 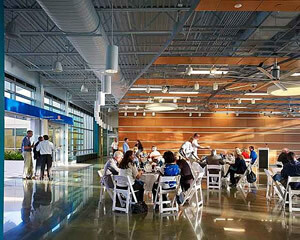 The open lobby allows visitors to stroll through the building as they commute from the main parking lot to the center of campus. Teaching spaces, faculty offices, and most collaboration spaces receive views to adjacent green space through large, sun-shaded windows. 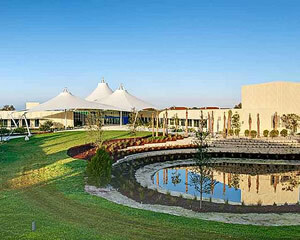 The college is located in a semi tropical environment on the west coast of Florida and the existing site is 4 feet above sea level in a FEMA zone which required a floor elevation 9.5 feet above sea level. The building’s first floor is 11 feet above sea level. Fill dirt was created by creating an onsite pond which doubles as a storm water control feature and provides additional onsite aquatic habitat, which was greatly desired by the biology faculty. Forty percent of students major in the sciences at Eckerd College, and nearly 50 percent of students say they chose the college because of its science programs. 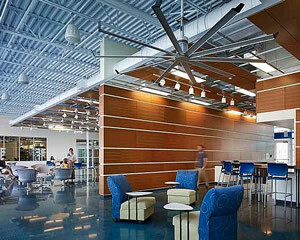 Seeking to further strengthen its distinctive science education program, Eckerd College commissioned the Center for Molecular and Life Sciences and a $5 million laboratory renovation. The science center houses the college’s biology and chemistry faculty and will support emerging pedagogies of biology and chemistry for the next 40 to 50 years. 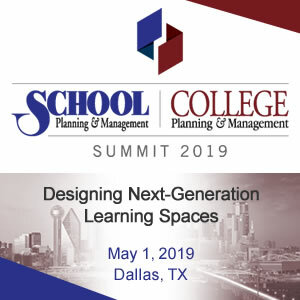 The new and renovated spaces are simultaneously a place for learning and an emblem of the college’s ambitions for liberal arts education in the 21st century: a personalized experience that cultivates the imagination and enhanced by excellent teaching and mentoring. State-of-the-art instructional technology supports interdisciplinary approaches in the sciences. Science is always on display in and around the James Center. 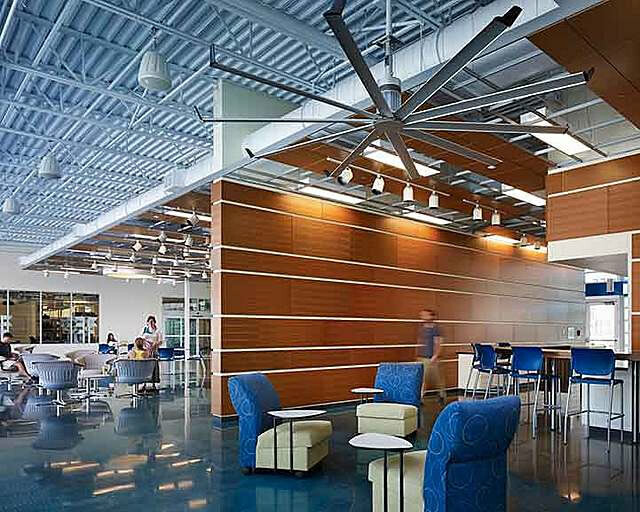 Eckerd College regards its surroundings as a living, breathing classroom and a laboratory for conservation and sustainable practices. Additionally, many of the laboratory spaces and lounge spaces are seamlessly integrated within the layout to encourage collaboration. Interdisciplinary collaboration is critical to the project success; therefore, chemistry and biology labs are collocated to encourage such interaction. Equally important was to engage undergraduates in research and easy access to faculty members. Teaching labs, research labs, faculty offices and informal collaboration spaces are located together to foster successful scientists and researchers. Exposing non-science majors to the sciences is achieved by the pass-through lobby. 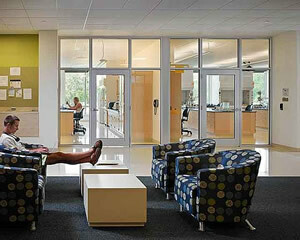 As students walk through the open space, they are exposed to research labs visible through large glass windows. Additionally, the building corridors include large expanses of glass showcasing scientific activities inside the labs. Outside each lab is a place to pin up research posters— fostering constant discussion about student and faculty work. Individual laboratory spaces are equipped with cutting-edge technology and audio visual equipment to satisfy the needs of today’s students. At the same time, the labs are designed to be very flexible to meet the needs of future generations. Every lab space is naturally lit to create an inviting environment for students to learn and faculty to teach. From its inception, Eckerd College has been committed to educating students about ecological and environmental stewardship. 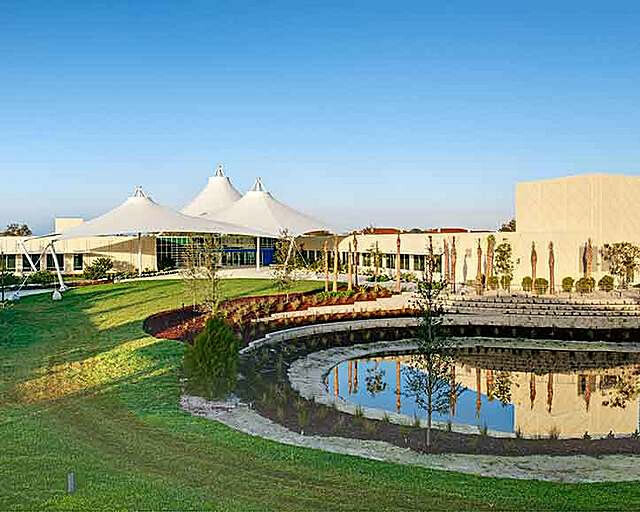 The college employs positive environmental landscape practices, such as landscaping with native plants, natural and permeable pedestrian paths and parking surfaces, and stormwater management via ponds and wetlands to filter storm runoff. The campus has a recycling program, a composting program, an “eco-clamshell” food container reuse program, a car-sharing program, and a bike-sharing program that earned the college special Campus Ecology Recognition by the National Wildlife Federation. Eckerd’s president signed the American College and University Presidents’ Climate Commitment in May 2007, and the college has since complied with the Commitment’s requirements, including conducting a greenhouse gas emissions inventory, developing an action plan for achieving climate neutrality, and implementing an Energy Star purchasing policy. Landscape Architecture: Hardeman Kempton & Associates, Inc.
Technology Consultant: The Sextant Group, Inc.